Two influential automotive marketers have been added to the May 20 Automotive News Marketing Seminar at the Westin Bonaventure Hotel in Los Angeles. 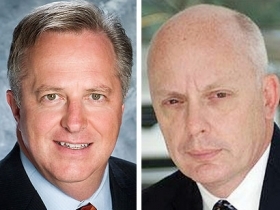 Chrysler's Steve Landry, executive vice president - North American Sales and Volvo's John Maloney, vice president, marketing and product planning have been added to the speaking faculty for the event that attracts more than 800 members of the West Coast marketing community. These two additions will join Joel Ewanick, vice president-marketing, Hyundai; Jack Hollis, vice president-Scion, Toyota Motor Sales; John Mendel, executive vice president-automotive sales, Honda; and Mike Sullivan, owner, Sullivan, Sullivan Automotive Group to complete the afternoon event's speaking roster. "We always fill the room to capacity at our Los Angeles Marketing Seminar," said Peter Brown, associate publisher and editorial director, Automotive News. "I think this year's panel will be particularly insightful as we learn more about the complex, stressful equation before today's marketers." Tickets for the event are $175 per person or $1500 for a table of ten. To register, visit www.autonews.com/seminar or telephone 313-446-0420. Registration begins at 11 a.m. and lunch begins promptly at noon. For those that can't attend the event in person, Automotive News is hosting a complimentary live Web cast, sponsored by Springbok Services. It will begin at 3:40 pm Eastern time, 12:40 pm Pacific time. To register for the Webcast, visit www.autonews.com/lawebcast.